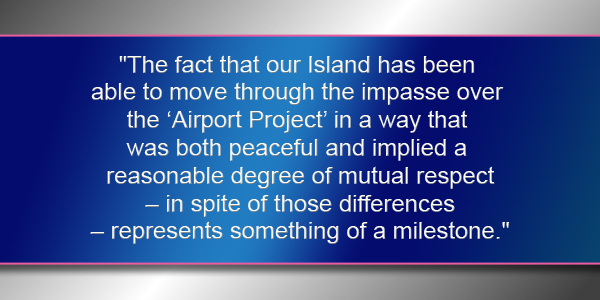 The fact that our Island has been able to move through the impasse over the ‘Airport Project’ in a way that was both peaceful and implied a reasonable degree of mutual respect – in spite of those differences – represents something of a milestone. To me, this marks a level of maturation in our relationships as a diverse society and is evidence of an acceptance that even close families will have differences on even mundane matters. I don’t believe any government project in our past, has been so extensively reviewed, as this one. There have been numerous forums, town-hall meetings and reviews on whether the unique approach for the project was in the best interests of the Island. It seems to me that there has been a shift in our community, regarding this project and this has been due to a variety of factors; including, the findings of the Blue Ribbon Panel. There were those who questioned the Panel’s objectivity, since it was appointed by the Government. However, the individuals who composed the Panel have a track-record of integrity. They are persons who have demonstrated a great degree of independence over the years; individuals whose skill and experience, spoke for itself. The conclusions of the Panel were only published last Wednesday and one wondered, if their findings would have reached the wider community. However, in this age of online media, the public have ready access to their Press Conference tape. While a recently published opinion poll suggested a major shift of opinion regarding the Airport Project, it was challenged as being ‘biased’. However, there was other evidence of change. This was graphically demonstrated in the response of the membership of the Bermuda Industrial Union to the call of their President – Chris Furbert – to protest at the House of Parliament on Friday. When less than 200 of the total membership of 2,500 or so, turned up at Union Square it was evident that members and others were voting on the matter ‘with their feet’. In his wisdom – knowing when to hold them; when to fold them and when to walk away – Chris sent those in attendance, back to work. This outcome represents something of a milestone in that the membership was exercising their independence. As Steven Covey pointed out – in 7 Habits- that retaining a sense of independence is vital for successful persons. That said, it is clear that any society benefits when its citizens are prepared to ‘think for themselves’. History is littered with evidence of when people ‘follow blindly’. Covey reminds us that when people are ‘independent’ they can be best able to be ‘interdependent’; meaning that out of that clear sense of self, only then can one have the capacity to act in true solidarity with others. I know all of us have had those personal victories in our past when we refused to just ‘go along with the crowd’. In this age of ‘Trump’, this factor becomes even more important. It will be more important that matters of public interest be considered with the utmost of careful reflection, by all of us. In this mode, we can accept having differences in perspective on matters, with others who may not be ‘on our team’. However, with a mindful approach we will be able to avoid being caught up in an emotional reaction to matters and respond to circumstances in ways that consider the big picture. I believe that the fact that we have been able to handle the challenges around the Airport Project, demonstrates to Bermuda that we can achieve that goal. tried to reading a former civil rights activist on the fence articles. Was there a prayer for peace, well how come no one discerned politricks sneaking in de House 5:00 in de morning. What an odd statement from Onion Juice! Surely, it was very peaceful at 5am in the morning and this clearly avoided any type of confrontation. Taking the last demonstration is an example, a large group of people physically and illegally prevented our elected MP’s from entering the House. Surely, ther prayer for peace was answered with common sense! Bunch of spinless cowards using de law to do their shady buisness. But you were ok with a private plane landing at n the dead of night with two uighurs on board. “a level of maturation in our relationships as a diverse society” – you must be joking. This was Bermuda at its worst. The government presents a gigantic, untendered contract to the public without ever having tried to justify the need for it. After months of evasion as to the rationale and the costs, it appoints its friends who know nothing about airport construction to a panel to bless it with a rubber stamp. The opposition, smelling a chance to take over the government without an election, attack the project for all the wrong reasons, whipping up xenophobia. They organize an illegal blockade of democratic institutions, arranging it so that old ladies get pepper sprayed for maximum dramatic effect. They stop only when their own supporters get tired of the cynical antics. This is third world stuff. The government disrespected the basic principles of open government while the opposition disrespected the basic principles of democracy and the rule of law. Bermuda has so much potential but its political parties are turning it into a place no one wants to be. There are so many things wrong with your statement. First you suggest that the panel are friends of the OBA, which if you know anything about the individuals involved, is hardly 100% correct. Furthermore, you are suggesting they need to be experts on airport construction to evaluate whether a deal is good or not- absolute rubbish. They were selected to evaluate the merits of a business deal which they were all perfectly qualified to do. The criticism of the opposition is a little off base as well. While the PLP/combined opposition have a track record of xenophobia, this is not the best example of them using it. The PLP turned this into a political football hoping to divide the country and in turn put party above country. It didn’t work and now they have egg on their face. The lack of transparency argument holds little water.. As far as government contracts, please name one deal with this level of detail provided to the public. Just one. I agree with your overall point that this was not Bermuda at it’s best. I just disagree that the blame is equally shared by all parties. This was like saying, after the slaves revolted they were freed, the slave masters didnt kill anybody and told them go make it on your own and all is good. How can someone evaluate a business deal without knowing about the industry? Would you use a dental hygienist to appraise your house value? Would you buy a restaurant on the advice of a dog trainer? The government appointed people with no knowledge of what it should cost to refurbish an airport. So all that they could do was read other people’s reports and agree with them, having nothing else to go on. Sure, other projects have been even less transparent. So what? Bermuda politicians should be held to standards higher than the even worse practices of the past. As for this not being the “best example” of xenophobic rhetoric, I guess that Bermudians are so immersed in hearing anti-foreigner attitudes that they don’t even notice until it rises to Ayo Kimathi levels. Believe me, the foreigners do notice it. A very balanced piece. Well done. This couldn’t have been written by Glenn Fubler. Contrary to “watching’s” comment I’m 100% sure that this article was indeed written by Glenn Fubler whom I greatly respect for his insightful and common sense approach to the issues of the day. Well said and spoken for many! Thank you, Mr. Fubler, for your mature voice, appealing to everyone’s better instincts. One example is the OBA MPs not knowing any details on airport deal, yet voting for it anyway. Another example is the plp/biu, and their sheep, not knowing anything about the deal, yet protesting it anyway. This is one view of how things transpired and I appreciate Mr. Fubler sharing his view. There will be many other views around this project and process. One view not mentioned in this article is the initial lack of public information, inclusion and participation in this very large and expensive project that will impact generations to come. Information came very late and after many communication fumbles created by the Government when they ignored the pleas of so many to communicate much better, early and clearly. Another perspective is that our current structure of politics, winner takes all, creates a climate where any public issue risks being hijacked by politic operatives who then spend their time convincing you they have your back and that of the larger Bermuda community. Look to the United States for daily examples of how this style is playing out. My concern is those some currently in power feel they won this battle, will keep doing what they did and remain convinced they are and were right while those that feel they lost will redouble their efforts – continuing our division and isolation. One can’t change the past, only try to learn from it. Let’s all respectfully demand that no matter WHAT party is in power, ALL reasonably large Govt. projects will ALWAYS have a high level of transparency, disclosure, scrutiny, accountability and discussion. What goal is Mr. Fubler is talking about? We have just given away a major asset to a foreign country and one of it’s economic interests. If it is not colonialism; it certainly a form of neo-colonialism; A reasonable degree of mutual respect? I think not. But you had no problem borrowing hundreds of millions of dollars from foreign bankers so we could spend those borrowed hundreds of millions dollars on foreign consultants. How about you stop spreading that lie, we didn’t give any asset away.